By far the most sustained piece of writing by Patricia Highsmith on the subject of fiction – her own and others' – can be found in her 160-page (in its 1981 revised edition) guidebook Plotting and Writing Suspense Fiction (orig. 1966). But Highsmith did pen the occasional piece for other publications too, both magazines (Plotting itself grew out of an article Highsmith wrote for The Writer magazine, and in 1989 she wrote an article for Granta magazine on the subject of Tom Ripley) and books (the 1990 Bloomsbury edition of Carol includes an afterword on the genesis of that novel). 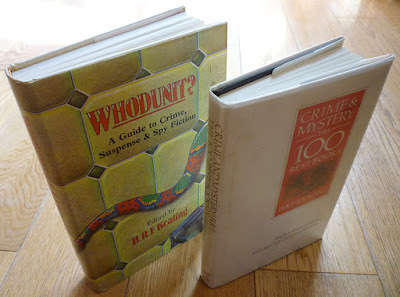 In the 1980s she twice contributed to books edited and written by the crime writer and critic H. R. F. Keating – Whodunit? A Guide to Crime, Suspense & Spy Fiction (Windward, 1982) and Crime & Mystery: The 100 Best Books (Xanadu, 1987) – and both pieces are well worth a look. I like to write three or four hours a day, taking a break frequently to do something such as finishing the last dishes in the sink, during which I am not-thinking about my work in progress. It is important that nobody else be in the house. Then my thoughts take a creative jump. Hard thought never did me very much good. I believe in letting one's mind alone. The only price I pay is having to rewrite, but not always a lot and mostly it is polishing, and having to cut a fair amount. To illustrate this last point, Whodunit? reproduces a manuscript page from People Who Knock on the Door, which at that juncture hadn't been published (it was published by Heinemann the following year). Highsmith additionally reveals that she could write up to two thousand words a day, worked seven days a week ("In principle... something always happens to prevent work one or two days a week") and that she was unable to "adopt the method of a famous writer who said he writes the action parts first and fills in the gaps later" but instead had to "write all the in-between material as I go". She reasons: "Maybe this is inevitable because of the subjective attitude I generally take: I describe what is in the head of the protagonist, psychopath or not, because what is in his or her head must explain as well as advance the story." Whodunit? itself is a thoroughly worthwhile book – there are essays by, among others, Michael Gilbert, John Gardner ("The Espionage Novel"), Gregory Mcdonald, Len Deighton and Eric Ambler, as well as writer-by-writer and character-by-character guides to crime fiction and thrillers – as is Crime & Mystery: The 100 Best Books, in which H. R. F. Keating offers a hundred two-page essays on key crime novels and their authors (the list can be found at Classic Crime Fiction). 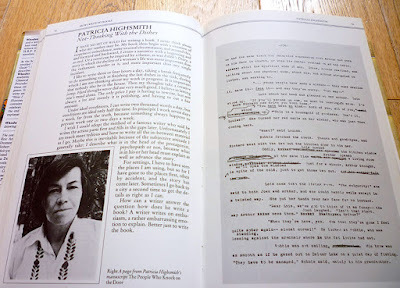 Highsmith penned the foreword to the book, in which she appears to demonstrate more of a working knowledge of the field than she suggested she had in Plotting and Writing Suspense Fiction (she maintained in that book that she "seldom read" other people's crime novels). She singles out, among others, Wilkie Collins, Raymond Chandler, P. D. James, Cornell Woolrich, Georges Simenon and, especially gratifyingly for me, P. M. Hubbard (albeit only in passing), and picks over Keating's musings on these and other authors. "One can open The 100 Best anywhere," Highsmith writes at the close of her foreword, "and be entertained by its contents, learn something new, or reinforce what is already in one's head." Not least in regard to Highsmith herself: Keating includes both The Tremor of Forgery (1969) – highlighting the "uneasiness" and "Fuzziness, ambiguity" of Highsmith's writing and "the to-and-fro indecisiveness of real life" she captures – and The Talented Mr. Ripley (1955), where he details the traits which make Tom Ripley such a compelling and, yes, charming character – "his genuine love of art and his true appreciation of the fruits of the earth... the simple affection he feels for his friends... his real interest in the earth-loving pursuit of gardening" and our "awed admiration" at "his willingness to take risks". He also recalls "a meeting of the Crime Writers' Association's Gold Dagger award where one of our number announced that if we chose Ripley's Game for the prize she would resign". Both Whodunit? and Crime & Mystery: The 100 Best Books are fairly readily – and cheaply – available (I found both for a few quid each in Colin Page Antiquarian Books in Brighton – where there is also, at time of writing, an expanded selection of secondhand crime fiction – a recently acquired collection, one which, needless to say, I've already raided). 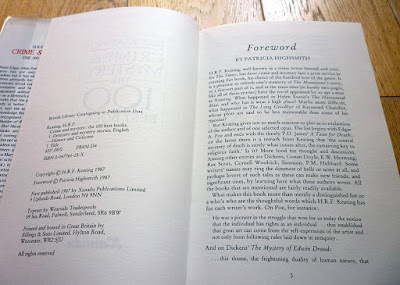 Not so the next Patricia Highsmith book I'll be blogging about: a signed association copy of the final novel in the Ripliad.